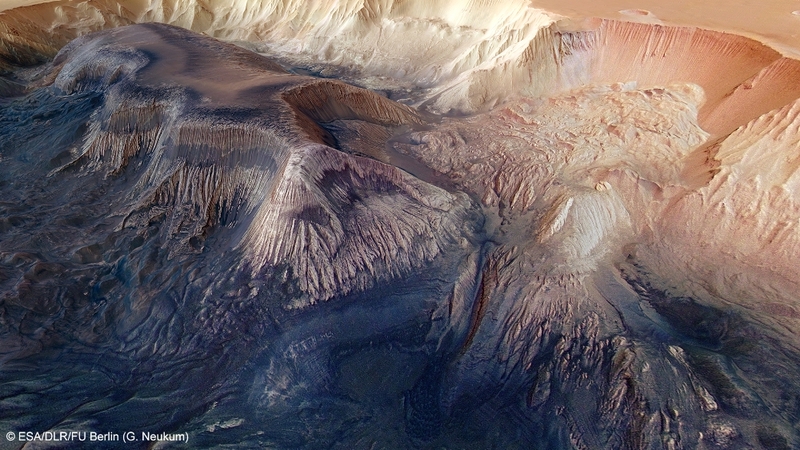 If an astronaut were to stand in the Hebes Chasma basin, the view would be extraordinary. Precipitous walls rise almost 8000 metres into the skies, and a massif similar in size to Mount Everest lies at the centre. 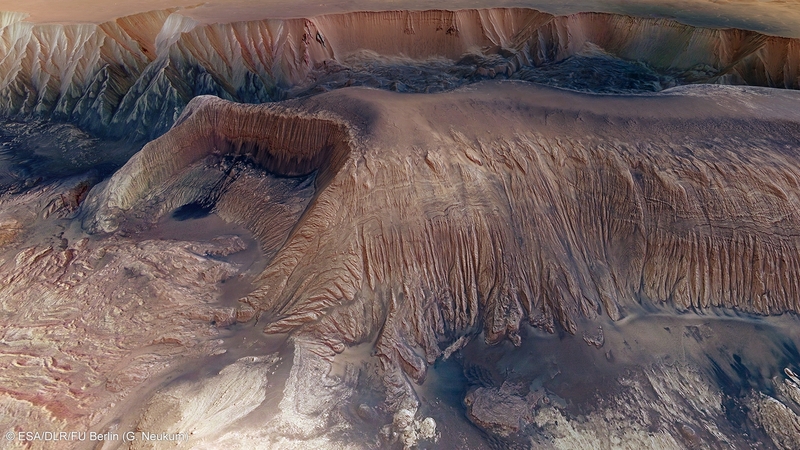 The German Aerospace Center (Deutsches Zentrum für Luft- und Raumfahrt; DLR) High Resolution Stereo Camera (HRSC), on board ESA’s Mars Express spacecraft, imaged Hebes Chasma during several overflights. The vast extent of this impressive landscape formation is revealed by a mosaic created using eight of the acquired images. Hebes Chasma is an endorheic (enclosed) basin stretching 315 kilometres in an east-west direction and 125 kilometres from north to south. The mesa, or flat-topped mountain, rising from the centre is over 100 kilometres long and between 10 and 20 kilometres wide. The summit of this elevation towers approximately 8000 metres above the lowest points of Hebes Chasma. A multitude of gullies are etched into the basin’s precipitous cliffs. Landslide deposits, possibly the remains of formations dislodged from the flanks, are scattered at the foot of the rock walls. These landslide deposits, which have been eroded, form a one to two thousand metre ‘mountain range’ in the basin. 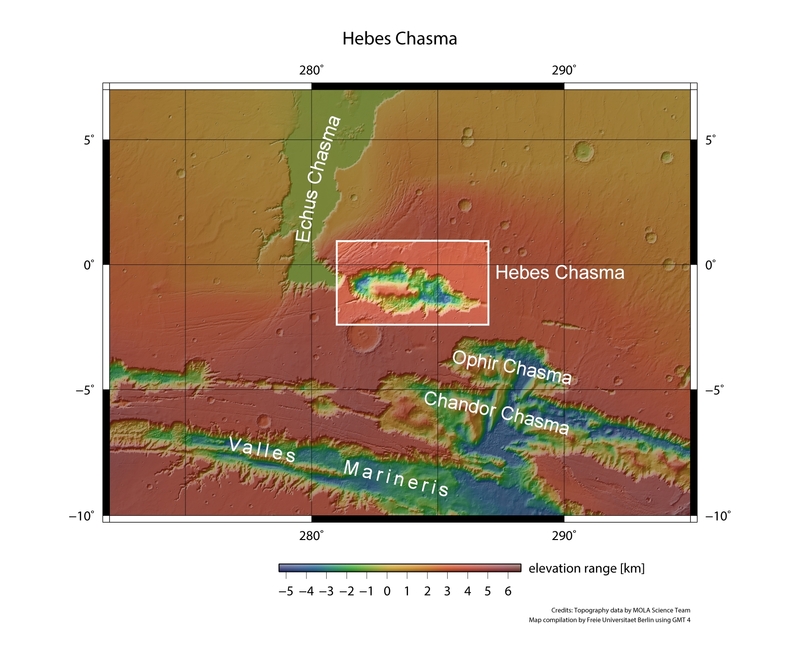 Hebes Chasma is located north of the vast Valles Marineris canyon. 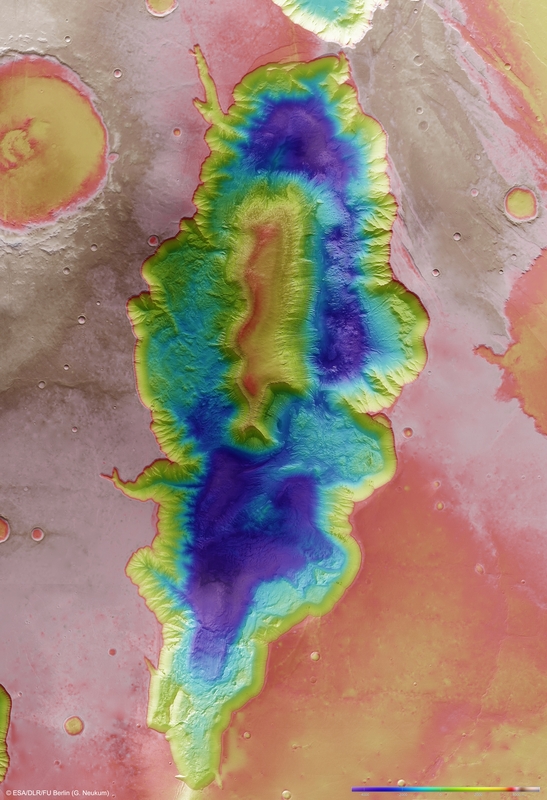 Like Valles Marineris, scientists suspect the origins of Hebes Chasma lie in the emergence of the Tharsis volcanic region, during which the surrounding crust bulged to a height of around four kilometres. As the bulge was swelled by the underlying magma, the crust fractured, creating deep scars in the high plains. The 8000-metre flat-topped mountain at the centre of Hebes Chasma is made up of numerous strata of different rocks, as can be seen clearly in the banded and layered flanks. These are sediment layers, most likely deposited by flowing or standing water. In some places, they consist of minerals with water molecules embedded in their crystalline structure, for instance calcium sulphate (gypsum) or magnesium sulphate (kieserite). These minerals – salts of sulphuric acid – also form in aqueous environments on Earth. OMEGA, the spectrometer on board Mars Express, and the CRISM experiment on the NASA Mars Reconnaissance Orbiter, identified gypsum and kieserite here and in morphologically similar areas. These sediment strata are referred to as ‘interior layered deposits’. It is not clear how the huge mountain in Hebes Chasma formed, whether it is the remains of an older plateau, sediment that formed when a lake or inland sea existed in the enclosed basin, or whether it may indeed be an accumulation of deposits blown in by the wind. What is clear is that there must have been water in a liquid state for at least part of its history. With time, the rock layers were exposed by erosion, which now permits their analysis using the experiments on board the Mars orbiters, and which provide important information on the geological development and climate in Mars’ early history. The images used here were acquired by HRSC during the overflights on orbits 7237, 2149, 5178, 5160, 5142, 6241, 3217 and 0360. The image center lies at approximately 1° southern latitude and 284° eastern longitude. 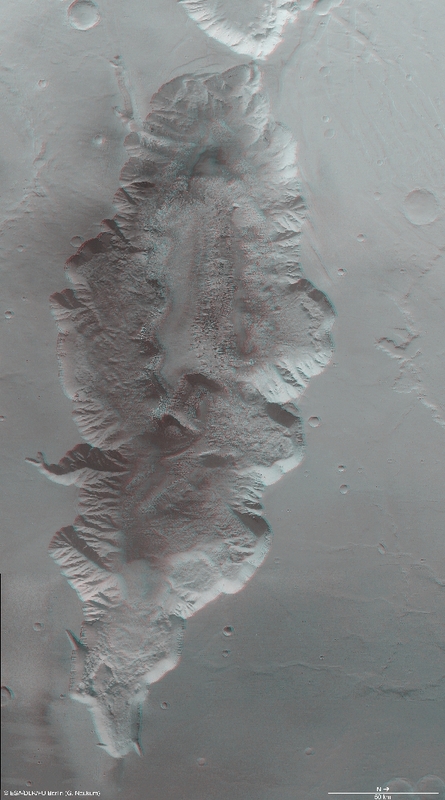 The colour image (4) was captured using the nadir channel, which is directed vertically down onto the surface of Mars, and the colour channels of the HRSC; the perspective oblique views (1, 5) were computed from data acquired by the HRSC stereo channels. 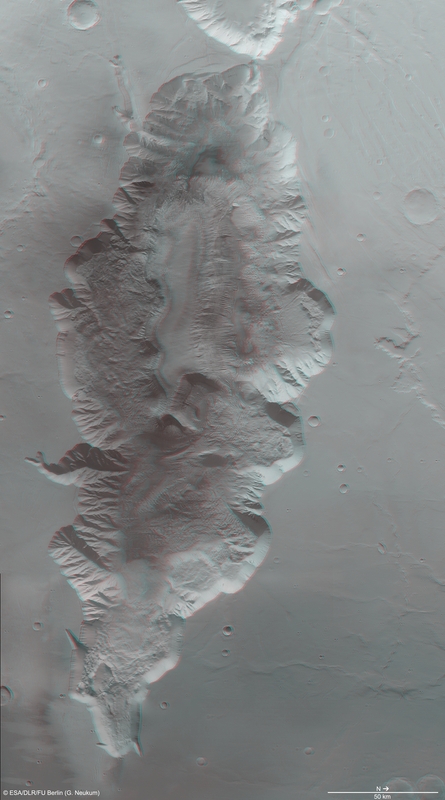 The anaglyph image (6), which creates a three-dimensional impression of the landscape when viewed with red/blue or red/green glasses, was derived from the nadir channel and one stereo channel. The aerial view, encoded in rainbow colours (3), is based on a digital terrain model of the region, from which the topography of the landscape can be derived. The High Resolution Stereo Camera was developed at the German Aerospace Center (Deutsches Zentrum für Luft- und Raumfahrt; DLR) and built in collaboration with partners in industry (EADS Astrium, Lewicki Microelectronic GmbH and Jena-Optronik GmbH). The science team, which is headed by principal investigator (PI) Prof. Ralf Jaumann, consists of over 40 co-investigators from 33 institutions and ten countries. The camera is operated by the DLR Institute of Planetary Research in Berlin-Adlershof. The systematic processing of the HRSC image data is carried out at DLR.